26th July 2018: SLT Human Capital Solutions (Pvt) Ltd (HCS) won ‘CEO of the Year Award’ and ‘Best Service Provider in HR’ achieving unprecedented dual honours at the recent Best Employer Brand Awards 2018. 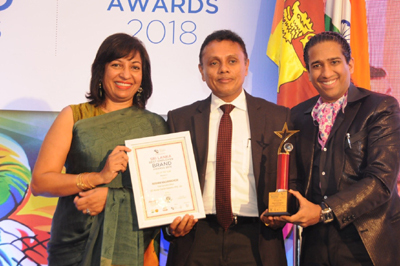 Roshan Kaluarachchi, Chief Executive Officer of SLT Human Capital Solutions was crowned ‘CEO of the Year Award’ and the organisation received the accolade for ‘Best Service Provider in HR’ at the 13th Annual Best Employer Brand Awards 2018 ceremony held in Sri Lanka. The winners were selected following a rigorous judging process whereby companies underwent a forensic scrutiny of their business to ensure only the very best made the final shortlist. HCS is a fully owned subsidiary of Sri Lanka Telecom PLC and for over a decade been providing a spectrum of unparalleled expert human resource solutions packaged with a high level of quality and efficiency to its impressive local and international client base. The double award win follows what has been a momentous year so far for HCS. Showcasing sustained growth, HCS impressively contributed over Rs Two billion in turnover as at 31 December 2017 to SLT Group revenues. Kaluarachchi’s achievements are impressive. His visionary leadership and foresight has helped transform HCS as an entity which provides unmatched expertise and consistently innovative HR solutions for its clients while at the same time encouraging individual intellect and teamwork. Offering experienced and professional expertise in telecommunication services, call centre, sales and marketing and customer support, HCS with a staff of 3000 has received global acceptance as a HR organization. With an aim to become a Rs Five billion revenue company in 2022, HCS’s strategic intent is to be the Number 01 total HR solutions organization in the country and continue to provide unmatched expertise and state-of-the-art HR solutions.